Back in March, I attended a music workshop in chilly (to Californians) Whidbey Island. Not only did Ruzivo teach us 3 songs for 8-piece marimba ensembles in less than 48 hours, each band member was also responsible for feeding us a delicious meal. This warming soup hit the spot on a rainy afternoon. We pretty much insisted that Zach, who’s been playing marimba professionally since age 11, give us the recipe. 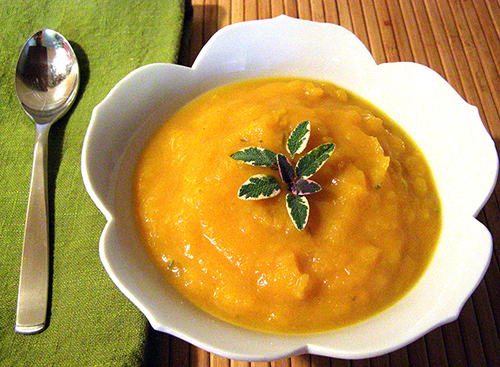 He said that though the soup is supposed to be pureed, he pureed just half—creating an agreeable texture. 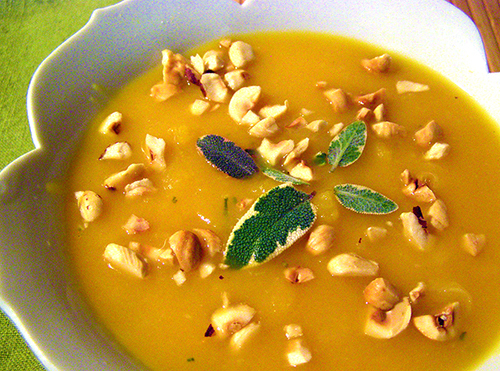 Cooler weather, impending frost on the garden sage, and Farmers’ Market butternut inspired me to recreate this soup. This butternut soup differs from most in that the squash is pre-roasted in the oven rather than cut into chunks and cooked in broth. The squash is scooped out rather than made into uniform cubes. This makes both the flavor and the texture unique. 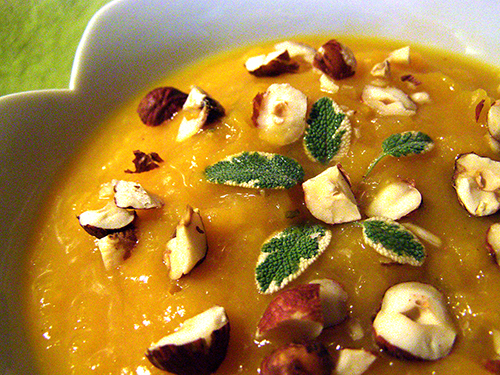 The unequal squash chunks lends a rustic flair to the dish. 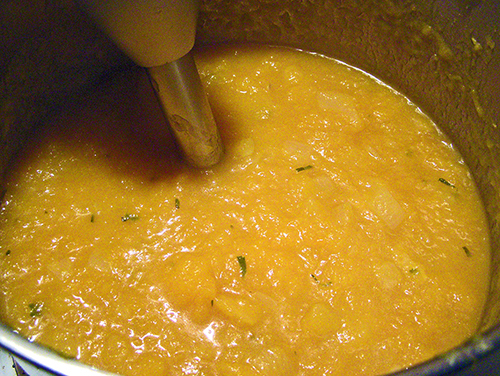 I added some honey to the recipe, which you can omit if your butternut is sweet. You can cut this recipe in half if you prefer. Not all sage is created equal in strength. You can always add more sage as topping if it doesn’t taste as strong as you like it. However, you can’t easily subtract sage once it’s in there. For best results, start with the smaller amount, adding more as needed. Hope you enjoy making and serving this easy and earthy autumn dish. 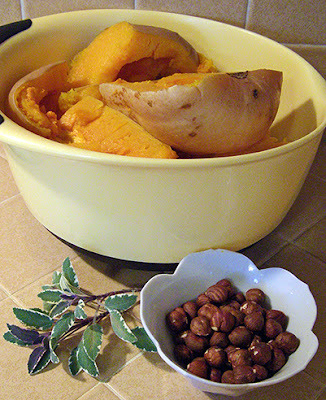 Cut butternut squash in half and scoop out seeds. Roast at 400 degrees F. until soft, about 30 – 45 minutes. Remove from oven. Turn down oven heat to 350 degrees F. Spread hazelnuts on baking pan and roast for 10 minutes, shaking pan twice so they’ll brown evenly. Cool slightly and put into a kitchen towel. Rub the towel over the nuts to loosen most of the husks. Remove the nuts to a cutting board and chop roughly. Set aside. 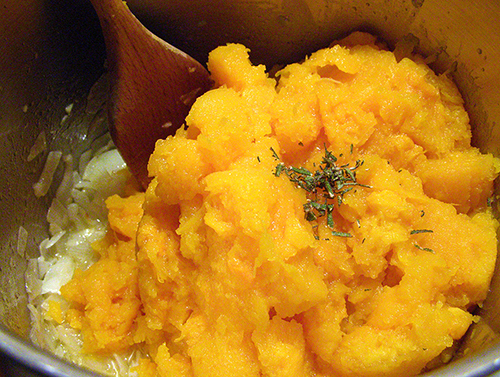 While squash is cooling enough to handle, melt butter in the bottom of a deep soup pot. Sauté onions until golden, stirring up from the bottom frequently, about 8 – 10 minutes. Remove from heat. Scoop squash out from skin. Add squash, broth, 1 tbsp. of the sage, and brown sugar if desired. Bring to a boil and reduce heat and simmer for 10 minutes to blend flavors. Serve soup topped with remaining 2 tbsp. sage (or more) and chopped hazelnuts. Garnish with small sage leaves.